Dutch born and self-taught chef Margot Janse moved to Zimbabwe in 1989. She started working in the kitchen of a well-known Johannesburg restaurant in 1992, pursuing her dream of becoming a chef. 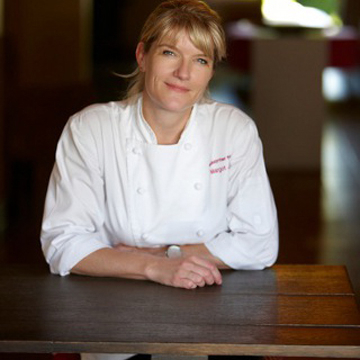 Margot has been the Executive Chef at the award winning, « Le Quartier Français » Hotel and « The Tasting Room » Restaurant in Franschhoek, South Africa for the last 21 years. She is known for her African inspired cuisine, celebrating the indigenous and often unknown ingredients of Southern Africa. Her surprise menu is presented by storytellers. Margot started her charity Isabelo « Feeding Hungry Minds » in 2009 and now feeds 1300 children every school day within the village of Franschhoek. « The Tasting Room » has been recognised as one of the « World’s 50 Best Restaurants » for 12 consecutive years, with 4 years being « The Best Restaurant in Africa and the Middle East ».